Marvel at the free-to-visit national landmarks in Washington, DC that make up America’s front yard. According to the American Institute of Architects, half of Americans’ top 12 favorite architectural gems line the National Mall. There’s no denying the significance of the Mall for its symbols to American history and for its uniquely designed monuments. Check them all out here, then it's time to explore by foot or while taking a Big Bus Tour. In honor of President Franklin Delano Roosevelt's four terms in office, the memorial is divided into four outdoor "rooms," where statues and murals stand to represent issues from the Great Depression to World War II. 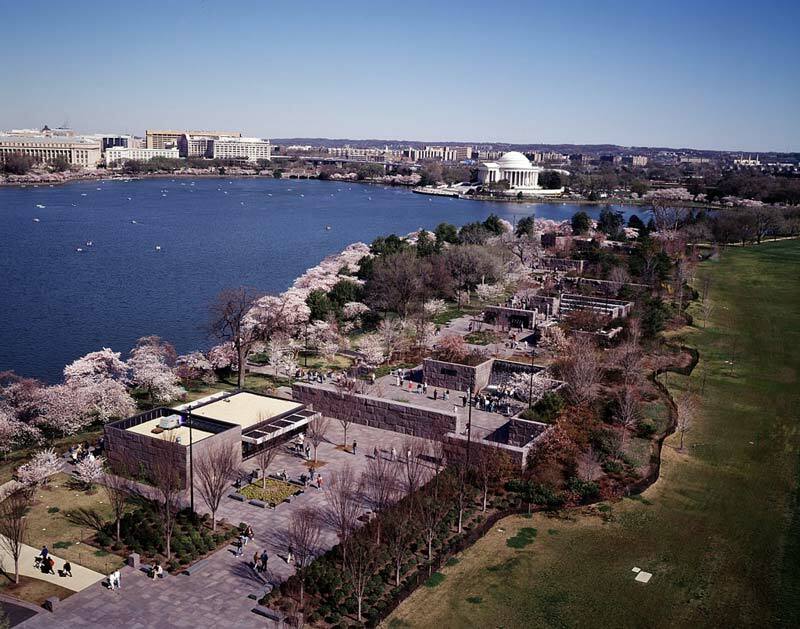 When visiting the FDR memorial, visitors have the opportunity to learn about and reflect on some of the most significant events in this country's history while enjoying some of the best views of the Tidal Basin and iconic cherry blossom trees that surround it. 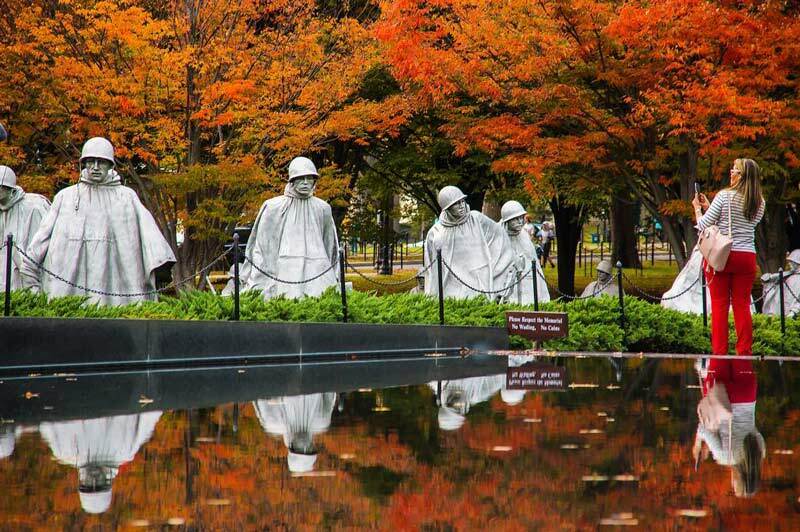 The Korean War Veterans Memorial was dedicated in 1995, on the 42nd anniversary of the armistice that ended the conflict. The memorial consists of 19 statues of soldiers representing a squad on patrol, drawn from each branch of the Armed Forces. The 19 figures create a reflection on the wall, symbolizing the border between North and South Korea: the 38th parallel. Alongside the soldiers stands the Mural Wall with more than 2,400 photographs of men, women, and dogs who served in Korea. 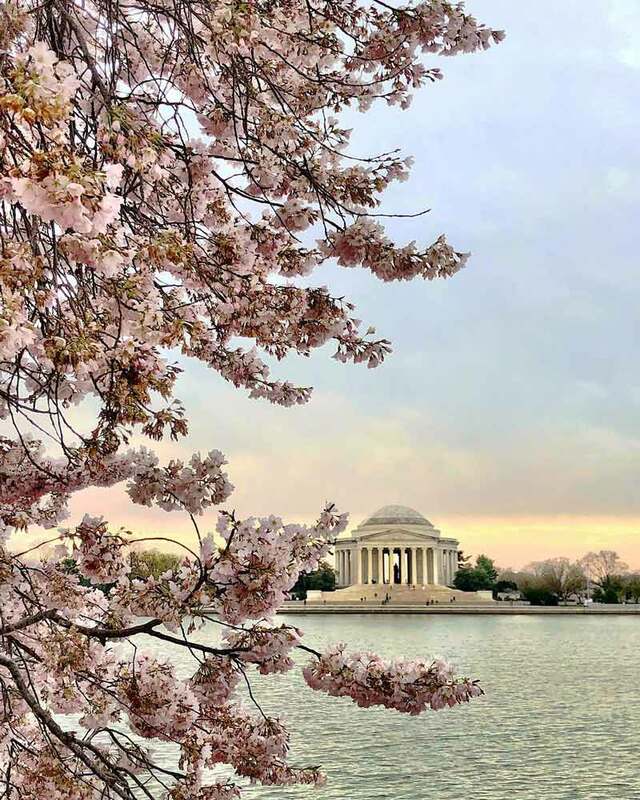 Frequently ranked by visitors as their favorite piece of architecture on the National Mall, the Jefferson Memorial serves as the site of many annual events and ceremonies including memorial exercises, an Easter sunrise service and the National Cherry Blossom Festival. The memorial, which stands as a symbol of liberty, was designed as a smaller version of the Roman Pantheon with marble steps and monumental Ionic columns; its interior holds a bronze statue of Jefferson and the walls are inlaid with excerpts from his letters, speeches and the Declaration of Independence. 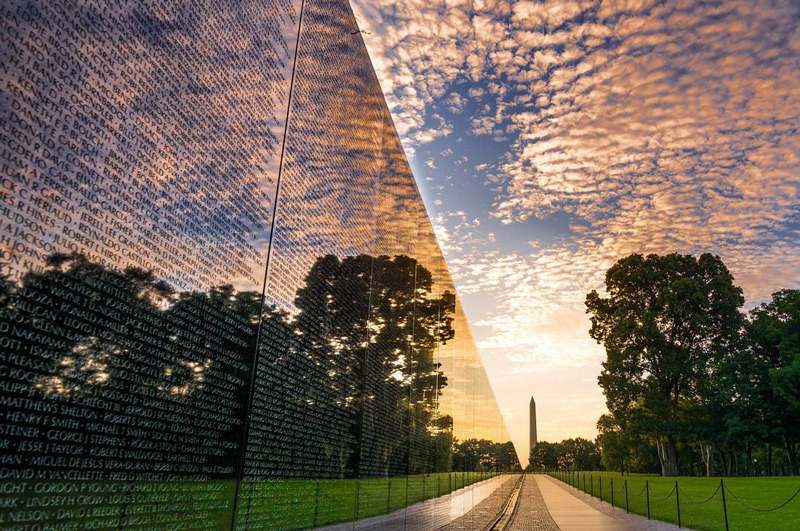 This memorial honors members of the U.S. armed forces who fought, died in service or were listed MIA during the Vietnam War. It is divided into three separate parts: the Three Soldiers statue, the Vietnam Women’s Memorial and the well-known Vietnam Veterans Memorial Wall. Controversy surrounded the memorial’s unconventional design for its dark color and lack of decoration, but it quickly became a place of grieving, pilgrimage and healing; today it stands as one of the most visited and moving memorials on the National Mall, as visitors have made a tradition of leaving mementos, letters and photographs of loved ones lost in the war. Dedicated in 2011, this memorial pays tribute to the famous American pastor, activist, humanitarian, and best-known leader in the civil rights movement: Dr. Martin Luther King, Jr. The memorial itself is based on a line from Dr. King's famous "I Have a Dream” speech, which was delivered from the nearby steps of the Lincoln Memorial during the March on Washington for Jobs and Freedom in 1963: "With this faith, we will be able to hew out of a mountain of despair, a stone of hope." The memorial depicts Dr. King as the “stone of hope” and the two pieces of granite placed near him as the “mountain of despair." 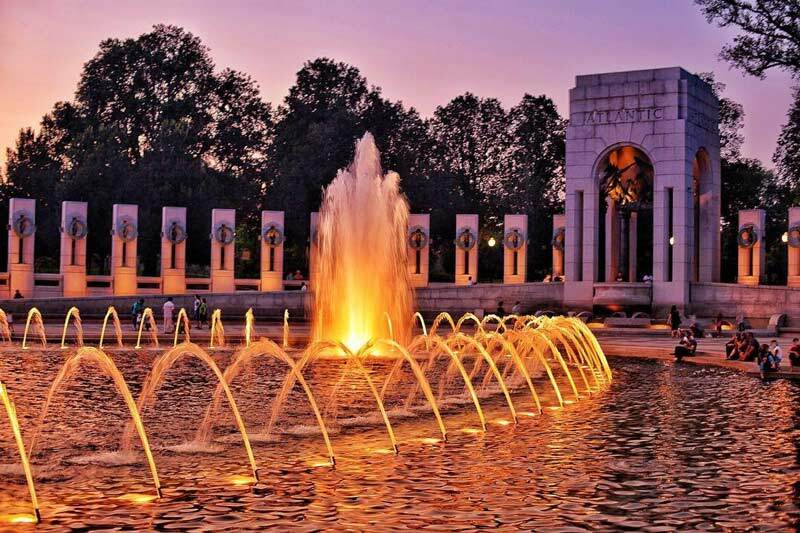 The National World War II Memorial, which honors the spirit and sacrifice of the 16 million men and women who served overseas and the more than 400,000 that perished, opened to the public in April 2004. The memorial built to celebrate the the heroes of the Greatest Generation remains one of the most visited sites on the National Mall, with more than 4.2 million visits in 2014. Each year, more than 300 Honor Flights bring World War II veterans, as well as those who served in the Korean and Vietnam wars, to the memorials dedicated to their service. 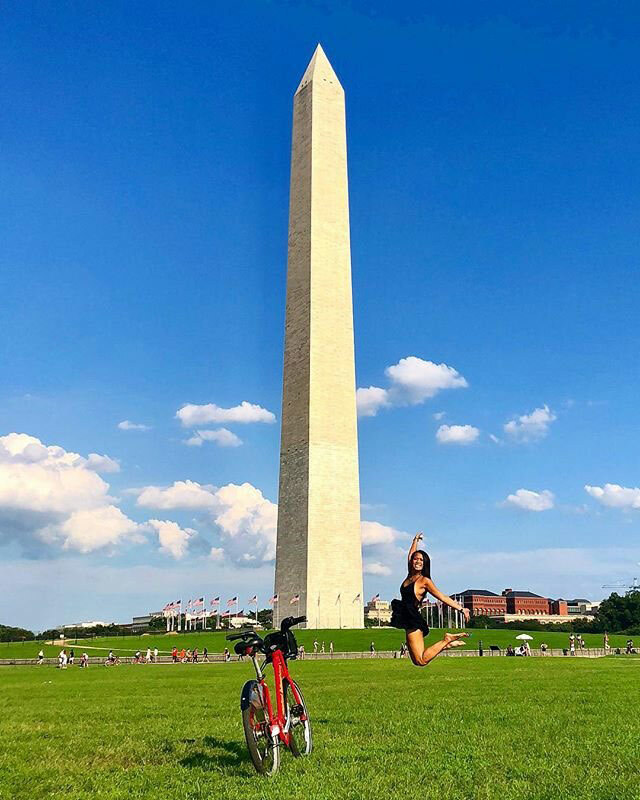 This monumental obelisk was built to honor George Washington, America’s first president, and stands today as the world’s tallest freestanding stone structure. Construction began in 1848, but a lack of funds, political squabbling and the Civil War interrupted the work from 1854 to 1877. A clear change in the color of the stones can be seen about one-third of the way up the monument; the slightly darker stones at the bottom were placed before construction paused, while the lighter stones above it were brought in from a different quarry following the Civil War. The Washington Monument is currently closed for repairs. Check the National Park Service's website for updates before you plan your visit. 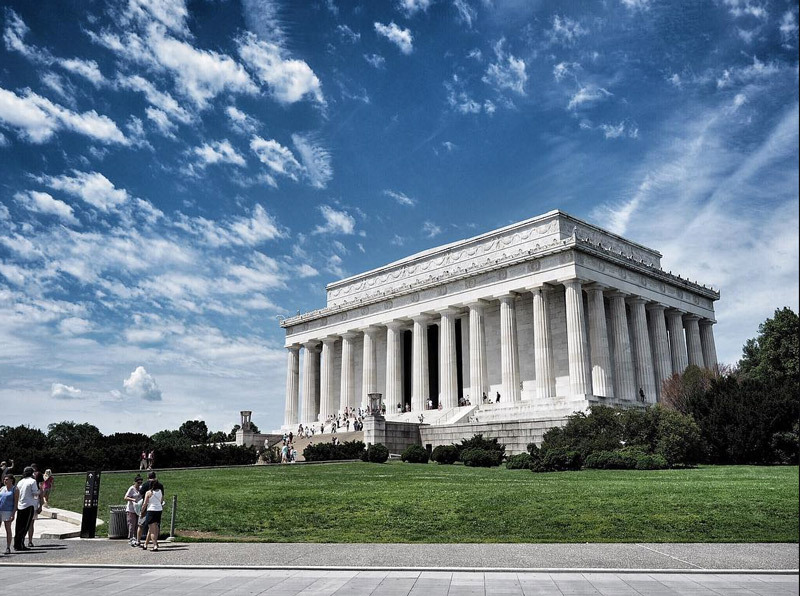 A perennial visitor favorite, the Lincoln Memorial stands at the west end of the National Mall as a neoclassical monument to America’s 16th president. A 19-foot statue of Abraham Lincoln sits overlooking the Reflecting Pool and the Washington Monument from his permanent seat on America's front yard. Dedicated in 1922, the Lincoln Memorial has been home to many defining moments in American history. Martin Luther King, Jr. delivered his "I Have a Dream" speech from the steps of the Lincoln Memorial in front of 250,000 attendees. Monuments and memorials aren't the only thing to love about the National Mall. Get the most out of your visit to the Mall by reading up on its full array of museums.